Organization for providing proper burial rites. There is hardly a congregation of Jews in the world without an association specially organized for the following purposes: to conduct the burial service without charge; to be present at the death of a member; to watch over the corpse, to cleanse and shroud it, and to accompany it with funeral procession; and to bury the body with religious ceremonies. The members are called ("mit'asḳim" = attendants, undertakers; (M. Ḳ. 24b). The society is known as ("holy association"), also as ("society for mutual benevolence"), or ("of true mutual benevolence"), derived from the last words of Jacob to Joseph: "I pray thee . . . deal kindly and truly [ ] . . . and bury me," etc. (Gen. xlvii. 29, 30). The members are also called ("interchangers of kindness," Ket. 8b). A burial society bearing this name is quoted in the Responsa of Simon b. Ẓemaḥ Duran, iii., No. 13 ( , 1361-1444). 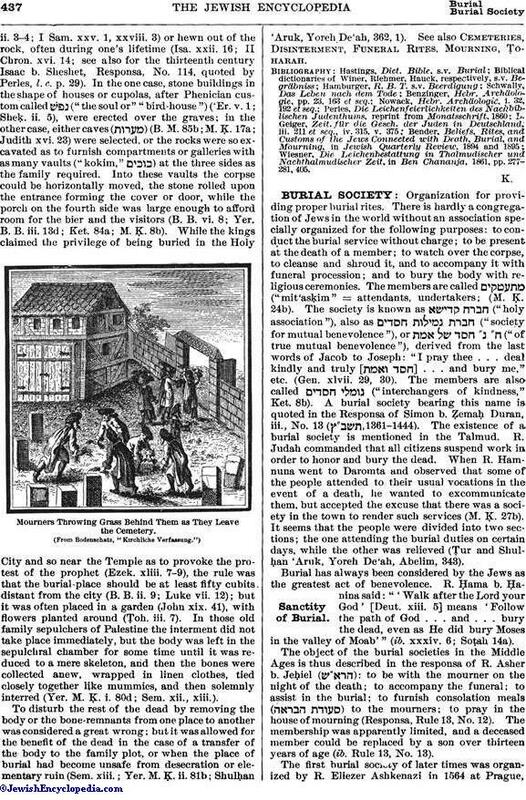 The existence of a burial society is mentioned in the Talmud. R. Judah commanded that all citizens suspend work in order to honor and bury the dead. When R. Hamnuna went to Daromta and observed that some of the people attended to their usual vocations in the event of a death, he wanted to excommunicate them, but accepted the excuse that there was a society in the town to render such services (M. Ḳ. 27b). It seems that the people were divided into two sections; the one attending the burial duties on certain days, while the other was relieved (Ṭur and Shulḥan 'Aruk, Yoreh De'ah, Abelim, 343). Burial has always been considered by the Jews as the greatest act of benevolence. R. Ḥama b. Ḥanina said: "'Walk after the Lord your God' [Deut. xiii. 5] means 'Follow the path of God . . . and . . . bury the dead, even as He did bury Moses in the valley of Moab'" (ib. xxxiv. 6; Soṭah 14a). The object of the burial societies in the Middle Ages is thus described in the responsa of R. Asher b. Jeḥiel ( ): to be with the mourner on the night of the death; to accompany the funeral; to assist in the burial; to furnish consolation meals ( ) to the mourners; to pray in the house of mourning (Responsa, Rule 13, No. 12). The membership was apparently limited, and a deceased member could be replaced by a son over thirteen years of age (ib. Rule 13, No. 13). The first burial society of later times was organized by R. Eliezer Ashkenazi in 1564 at Prague,with rules, regulations, and amendments by R. Moses Möln ( ) in 1573. It received the sanction of the Austrian government on June 1, 1742 (Preface to , Prague, 1828). Some of the societies, however, exercised arbitrary power in the communities. They virtually owned the cemeteries and usurped the right to dispose of the plots as they pleased. When the ground became expensive and government taxes burdensome, it was customary for the rich to pay for their burial-plots, the income so derived being employed to defray the burial expenses of the poor. Often the societies exacted exorbitant sums from the rich, and even from the middle classes. To remedy this abuse a conference of the Council of Four Lands ( ) assembled at Gramnitz in 1683, and passed resolutions to nullify the practise of the societies in dealing unjustly both with the dead and the living by delaying burial till the payment of a compulsory compensation was settled. The conference passed a decree excommunicating and imposing a fine of fifty ducats upon the leaders of any congregation which permitted the members of a burial society to extort more than 150 gulden for the burial of a rich man; and the approbation of the leaders and the chief rabbi was to be obtained before payment was made of the minimum sum of 30 gulden, or upward. This decree was renewed and promulgated on market-day in every congregation at Bieroslav in 1698, and was registered in the congregational record ( ). The society, in order to prevent abuses, appointed one day in the year as a fast-day, to be devoted to prayer and to visiting the cemetery, to attend to necessary repairs of the graves and headstones, and to be followed at night by a sacred feast, to which every member was invited (see in G. Wolf, "Die Jüdischen Friedhöfe und die Chewra-Kadischa in Wien," an invitation from the seven Jewish town councilors to the members of the holy association to partake of the sacred banquet on Tuesday in the week of the sidra Shemini, in the year 5080=1320). On May 5, 1764, the Vienna burial society was reorganized by R. David Wertheim; and among the rules adopted was one fixing the annual fast-day for Adar 7. A proviso was inserted that the feast after the fast must not be too costly. One of the largest Ḥebrah Ḳaddishahs is the one in Budapest, which includes several societies. It has a yearly budget of half a million crowns. A burial society was organized in 1793 at Kiev, Russia. The burial charge for members and dependent persons was ten gulden. The members were granted certain privileges in the synagogue, such as leading in prayer and reading the Torah on Hoshanah Rabbah and Shemini 'Aẓeret in the Tabernacle festival. On the former day the election of the officers took place. The annual fast and feast were held on Kislew 15, which is the day observed by most of the societies. On reorganizing the Ḥebrah Ḳaddishah of Odessa in 1878, the maximum price for a rich burial was 60 rubles, the minimum for middle classes 12 rubles, and free burials for the poor ("Ha-Ẓefirah," 1878, v., No. 48). In New York the oldest burial society, Ḥebrah Ḥesed ve-Emet ("loving kindness and truth"), was established by the Portuguese-Jewish congregations in 1802. The society recently celebrated its one hundredth anniversary at the Shearith Israel synagogue. The German-Jewish communities all through America organized free burial societies, following the example of their brethren in Europe; and these were, or are being, in the course of time merged into the united Hebrew relief societies of each town. 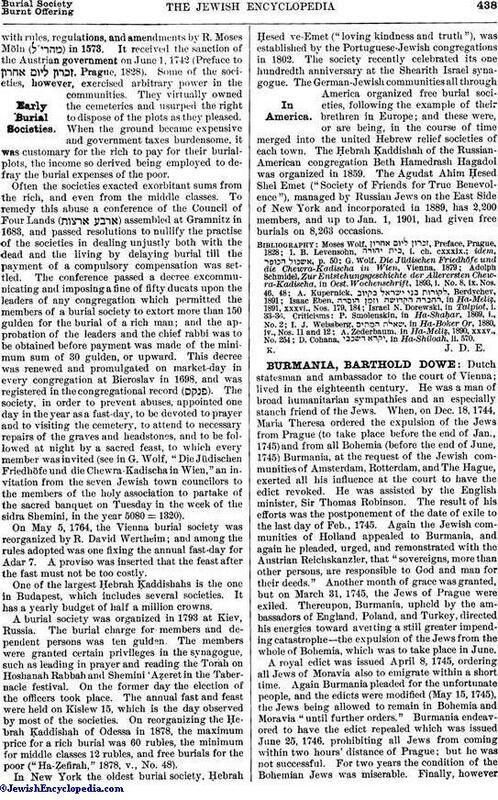 The Ḥebrah Ḳaddishah of the Russian-American congregation Beth Hamedrash Hagadol was organized in 1859. The Agudat Ahim Hesed Shel Emet ("Society of Friends for True Benevolence"), managed by Russian Jews on the East Side of New York and incorporated in 1889, has 2,200 members, and up to Jan. 1, 1901, had given free burials on 8,263 occasions. D. Cohana, , in Ha-Shiloah, ii. 570.